The list has been named. 6 Rossoneri are in the List. David Beckham (LA Galaxy), England. Fabio Cannavaro (Real Madrid), Italy. Iker Casillas (Real Madrid), Spain. Petr Cech (Chelsea), Czech Republic. Rogerio Ceni (San Paolo), Brazil. Didier Drogba (Chelsea), Ivory Coast. Miroslav Klose (Bayern Munich), Germany. Guillermo Ochoa (America Mexico), Mexico. Franck Ribery (Bayern Munich), France. Wayne Rooney (Manchester United), England. Paul Scholes (Manchester United), England. Luca Toni (Bayern Munich), Italy. Kolo Toure` (Arsenal), Ivory Coast. Jose` Fernando Torres (Liverpool), Spain. Ruud van Nistelrooy (Real Madrid), Holland. Robin van Persie (Arsenal), Holland. The above had a joke 4 a season. Those awards r bcoming more n more ridiculos. Milan related : Nesta was far better than Maldini. 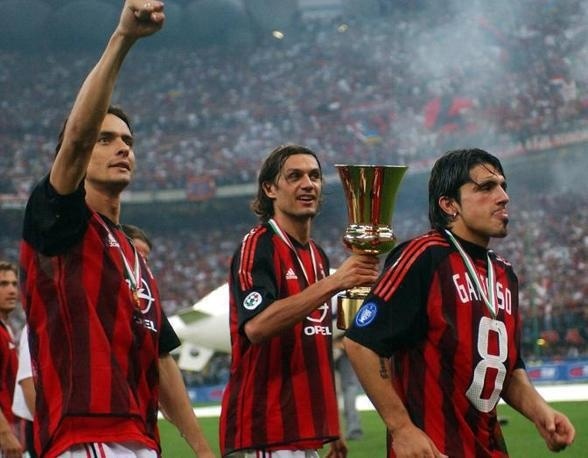 And Pippo scoring what , 6 goals last season ? Last edited by Wild; 21-10-2007 at 12:26. Also the poll should b "who u think deserve"not "who will b"
All here think its should b Kaka while I think that Seedorf had a better season than Kaka last season. In all , I think C.Ronaldo should win it. Seems that this year, there will be 2 trohpies. Torres real names are Jose Fernando? (it's so wrong that I'm more surprised by that than his nominee, which is ridiculous eitherway). Oh God, I just saw Beckham made it to the list! He, Wild guys like Nakamura were nominated cause this year they are going to give one per continet (seeing some of the names there...guys from Iraq, Mexico) and of course they hardly know who to give it from there, so better go for the famous guy that plays for Celtic. At least the absenses in this list are not big. It has more ridiculous names, but the thing that counts is that they at least don't leave out the best ones. but to tell u it's not important to have the best here. coz the best didn't play well last year so it's the award of the year so if the best didn't do well then they r not in the list. and pls don't talk about C. Ronaldo i hate him. specially his loose tricks, don't compare him with kaka' coz kaka' is a complete player who wants is goals. no showcases like C.Ronaldo, but kaka' is something different assists, finish, style, dribbling when needed not like C.Ronaldo Dribbling all the time no assists. i like the most is his trademark runs hooooooooooooooooo. sometimes runs all the pitch. Kaka' is simply the best. Since this isn't Olympic boxing....Kaka will win it easily. The Ballon d'Or usually has a clear-cut deserving player. When it does not....it will go to someone in the back four (ala Cannavaro and Sammer). Congrats to Ricky for winning the award! Well deserved 110%! Sergio Agüero (Atletico Madrid), Argentine. Andreï Archavine (Zénith Saint-Pétersbourg), Russia. Gianluigi Buffon (Juventus Turin), Italy. Samuel Eto'o (FC Barcelone), Cameroon. Fernando Torres (Liverpool FC), Spain. Steven Gerrard (Liverpool FC), England. Zlatan Ibrahimovic (Inter Milan), Sweden. Lionel Messi (FC Barcelone), Argentina. Franck Ribéry (Bayern Munich), France. Sergio Ramos (Real Madrid), Spain. Edwin van der Sar (Manchester United), Netherlands. Rafael van der Vaart (Hamburg SV puis Real Madrid), Netherlands. Ruud van Nistelrooy (Real Madrid), Netherlands. Nemanja Vidic (Manchester United), Serbia. David Villa (Valence CF), Spain. Youri Zhirkov (CSKA Moscou), Russia. Kaka is the only Milan and Brazil player on the list. as much as i LOATHE him, if anyone except cristiano ronaldo wins this, the award will confirm itself as a joke. ^ agreed the guy has done everything and been everything for his team....people talk about Rooney's and Tevez's supporting roles which I agree cannot be underestimated but you only have to to look at how manU started their season to see just how much they depend on CR7. The ONLY player that I won't completely discredit the awards if he doesn't win is Fernando Torres. The awards must come from either of those two. I'd put Casillas instead of Torres.